Real Tweets from Real NFL Players - Replacement Refs Riot! Real Tweets from Real NFL Players – Replacement Refs Riot! Monday Night Football was the scene of NFL armageddon as the Green Bay Packers had victory literally stolen from their grasp by the Seattle Seahawks and the NFL's replacement referees. As seen by the picture above from Tim Burke, Green Bay defender M.D. Jennings intercepted Russell Wilson's game ending Hail Mary attempt as Seattle receiver Golden Tate tried to get a piece of the football. Inexplicably, as Jennings possesses the football and Tate tries to place a hand on it, one referee ruled dual possession and a touchdown for Seattle. Another ref ruled an interception. Somehow, a touchdown was called on the field, reviewed, and confirmed! 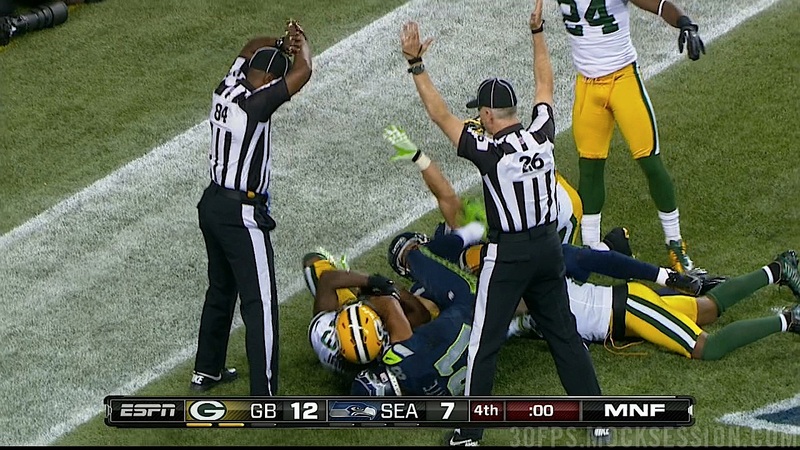 The replacement refs have been a nightmare for three weeks, but this is the NFL's doomsday scenario. MNF broadcasters Mike Tirico and Jon Gruden brutalized the league and its officials with a dose of serious reality that should make anyone associated with the NFL shameful at what happened tonight. The only time I can remember the game announcers reacting in such a way was when Mike Breen and Bill Walton were describing the events of Malice at the Palace. Seriously. Everyone at ESPN should be applauded for taking their most expensive television partner to the woodshed for the atrocity of sport witnessed in Seattle tonight. This game will forever stand as one of the lowest points in the 85+ year history of the NFL. How's that look on your resume, Rog?